A personal ‘My Wellbeing’ page to save your favourite recipes. A monthly newsletter where you’ll be the first to find out about our exclusive offers, events and competitions. Whether you’re eating it on toast or transforming it into a facemask, the mighty avocado has become one of the most popular fruits of the 21st century, and rightly so – it’s one of the most nutritious foods on the planet. Containing lecithin, beta-carotene, vitamins E and C, as well as plenty of other good-doing compounds and fats, the avocado has been eaten for centuries in its native South America. Originally, avocados were revered for their medicinal properties, and the oil was used to treat problems such as toothache and dysentery. It wasn’t long before they were discovered by the conquisadores in Mexico, who adored them, and originally thought they were a type of pear. It was this, and the fruit’s rough skin, that led to their still-popular nickname ‘alligator pear’ and later, ‘avocado pear’. Avocados now grow in many countries with a subtropical or tropical climate but travel well thanks to the avocado ripening after harvest. Surprisingly it was only five decades ago, in October 1962, that the first avocado hit UK supermarket shelves. Arguably, one of the most delicious and popular ways to eat avocado is to mash it into a guacamole with fresh chilli, lime juice and coriander – the zing of the lime and chilli cuts through the creamy, rich fruit creating a wonderful blend of flavours. 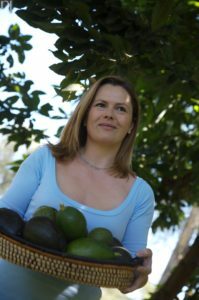 Read on to discover why I love this fruit so much, as I reveal the real health and beauty benefits of avocados: the nation’s favourite superfood. Thanks to their strong levels of folate (folic acid), avocados are beneficial for both mind and body. Depression has been linked to low folate levels and studies show supplements have a positive effect on cognitive function when a patient is depressed. Folate is also essential for foetal development as it is a coenzyme with nucleic acids such as DNA and RNA – helping to build the baby’s body and prevent neural tube deficiencies (NTDs) that can lead to problems such as spina bifida. 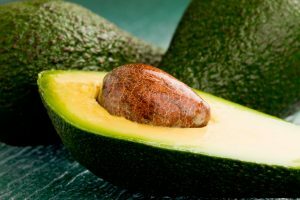 Folate is also thought to lower the risk of premature birth and some congenital irregularities such as a cleft palette and limb and heart defects: a good reason for expectant mums to add some avocado into their daily diet. It is well known that avocados contain a high amount of fat but, despite being nearly 30% plant fat, they contain no cholesterol and the vast majority of the fat is the monounsaturated kind. This healthier fat is also found in rapeseed and olive oils and is essential for the maintenance of our cells, as well as helping to reduce the ‘bad’ form of cholesterol. The fat in avocados has some anti-inflammatory properties and is also thought to lower triglyceride levels (which when raised could make you pre-diabetic), leading to lower levels of cholesterol. A handy lunchtime choice, avocados contain around 140 calories per 100g (compared to 400 calories per 100g for Cheddar cheese), so swapping a cheese sandwich for an avocado wrap is a healthy option. Calorie counters may also like to know that half an avocado clocks up only around 110-180 calories, depending on size, and is also simple to eat on its own or with a spoonful of low-calorie cottage cheese. Do note, though, that all fats – even the monounsaturated kind – should be eaten in moderation to avoid weight gain. Avocado is not only beneficial for us on the inside but on the outside too. Thanks to its high vitamin E levels, avocado can help to moisturise our skin and, when applied topically in the form of avocado oil, it can penetrate the uppermost layers of the skin’s surface to carry its vital vitamins and essential fatty acids within the epidermis to help delay skin degeneration and slow the signs of ageing. A small spoonful of avocado oil added to a warm bath is also an excellent skin smoother and softener. Fancy a new foodie flavour? 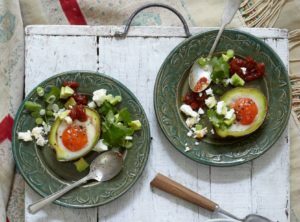 Why not experiment with this fantastic fruit and try our favourite avocado egg cups with chilli jam, spring onions, coriander and feta? It’s the perfect dish for a wellbeing weekend brunch.